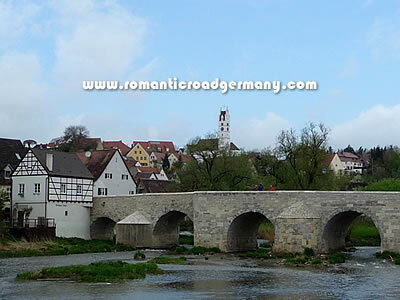 Harburg is a pleasant daytime stop on the way south down the Romantic Road. It is located just to the south of Nördlingen and close to the larger settlement of Donauwörth. However Harburg - also known as Harburg (Schwaben) to distinguish it from the better-known Hamburg city suburb - is well worth a stop to wander around the impressive sights. Harburg has the look of a town from the Middle Ages - an impressive castle up on the hill and the settlement down below on the trade route (in this case road or river). The name itself is thought to have come from old German and, if that is correct, would have meant "castle above a bog". 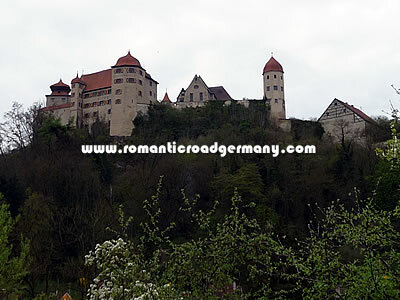 The castle was built by the former Hohenstaufen emperors of Germany in the 11th or 12th century. As such it is considered as one of the oldest castle fortifications in Germany. Harburg castle now belongs (as it has done for nearly three centuries) to the Count of Oettingen-Wallerstein. The present-day fortifications mainly date from the 18th century and can be visited in summer from Tuesday to Sunday. There is also a small hotel-restaurant in the castle. The town of Harburg below with its population of small farmers and handworkers remained dependant on the transactions and alliances of the noble families as the castle shifted from one owner to another which, in some cases, involved the preferred brand of Christianity changing. In fact, the time of the Reformation was a time of turbulence in this area (Swabia) as the teachings of Martin Luther (and the theories of some peasant leaders) led to a series of wars between the nobility and their workers. Later on the area was invaded by French troops under Napoleon until finally a period of relative peace and prosperity followed in the later 19th century, accompanied by the official grant of township and connection to the railway network. The narrow streets of the town were finally freed from the traffic on the north-south route along the Wörnitz by the construction of a road tunnel under the castle hill.